At 10:31 p.m. PDT on Aug. 5, after nearly nine months of travel, NASA's Mars Science Laboratory mission (with a rover named Curiosity) will arrive at the Red Planet. The $2.5 billion rover will begin a two-year quest to explore the interior of Mars' Gale Crater and hunt for evidence of an ancient ocean there. But before this hunt can begin, Curiosity has to land. The Mars Science Laboratory landing sequence has been the topic of much discussion even before the mission launched on Nov. 26, 2011. Nicknamed "seven minutes of terror," the spacecraft's entry, descent and landing sequence will require a lot of things to go perfectly right — all before anyone on Earth receives even a single signal, due to the length of time it takes for information to travel from Mars to Earth. "By the time we get the first signal that says 'okay, I've now reached the top of the atmosphere,' in reality the rover has already been on the surface for seven minutes," said Steven Sell, deputy operations led for Entry, Descent and Landing at NASA's Jet Propulsion Laboratory in Pasadena, Calif. "It's like your kid playing in the big game, and you can only sit there in the stands and watch. It's a nail-biter all the way." The first step in this process will be a guided entry, during which the entire MSL spacecraft (currently consisting of the rover and descent stage tucked into a protective aeroshell) will adjust its course toward its 12-by-5-mile-diameter landing ellipse — only an eighth the size of the landing targets of previous rovers. As it impacts Mars' atmosphere at more than 13,000 mph, MSL's heat shield will take the brunt of the frictional heating generated by the deceleration, and will soon glow white-hot with temperatures reaching 1,600 degrees Fahrenheit (870 degrees Celsius). Even through this, MSL will still be physically guiding itself toward Gale Crater, firing rockets to keep it on track. Then, with the surface of Mars still approaching rapidly, the spacecraft's heat shield will be jettisoned, exposing the actual rover and allowing it to use its radar guiding system to determine just how high it is. This is one of the most crucial parts of the descent, since it's not until then that MSL will be able to check its altitude. "When the heat shield comes off and the radar turns on, we need to find the ground," said Sell. "When we first eject the heat shield we're too high for the radar to see the ground yet, so we have to wait a very long 20 to 30 seconds, up to a minute, until the radar can get close enough to the ground to be able to see it. Without that solution it doesn't even try to do the rest of the landing." And once that's all done, it'll really start to get interesting. At nearly 2,000 pounds (900 kg), Curiosity is simply too large to land with airbags like previous rovers. Instead, engineers devised a method that's never been attempted before: a sky crane. When MSL reaches precisely the right altitude, its descent stage, gripping the Curiosity rover within the sky crane structure, will drop from the aeroshell and quickly fire its thrusters, moving it safely away from the falling back shell and slowing it further. Curiosity will be carried steadily downwards by the descent stage, which will use its Mars Descent Imager (MARDI) camera to maneuver over its target and, once at a height of 20 meters (about 65 feet) use rockets to hover in place while it lowers the rover down to the surface on bridles and an umbilical cord — all three of which are bearing the weight of the rover. This graphic portrays the sequence of key events in August 2012 from the time the NASA's Mars Science Laboratory spacecraft — with its rover Curiosity — enters the Martian atmosphere to a moment after it touches down on the surface. Although the system has been exhaustively tested on Earth using simulations and very advanced computer models, the first time it's going to play out in full will be during the actual landing on Mars. "It's the ultimate field test," Sell said. As soon as Curiosity has touched down, the cords will be cut and the descent stage will soar safely off to the side, crashing onto the Martian surface far enough away to pose no danger to the rover. At this point Curiosity, wheels down, is ready to begin its mission. That is, as long as everything goes exactly and precisely as planned. On the night of Aug. 5, the entire world — not to mention quite a few folks at JPL — will be watching to see how a rover the size of a Mini Cooper can be sent hundreds of millions of miles to touch down on the surface of another planet. "We've been preparing for this for many, many years … we're excited to get out there and land this thing," Sell said. 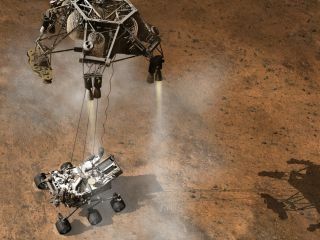 Visit SPACE.com for complete coverage of NASA's Mars rover landing Sunday. Follow SPACE.com on Twitter @Spacedotcom. We're also on Facebook & Google+.